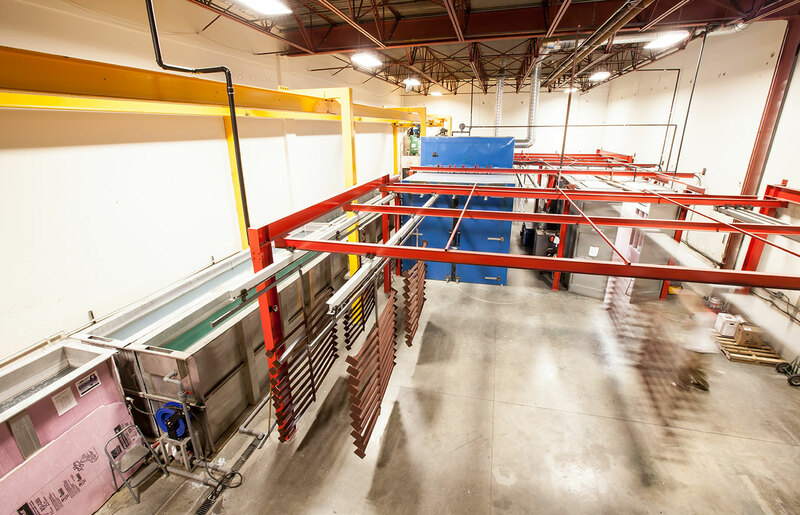 Powder Coating / Finishes – Innovative Aluminum Systems Inc. Innovative Aluminum’s advanced powder coating process results in a hard-wearing, extremely durable finish. 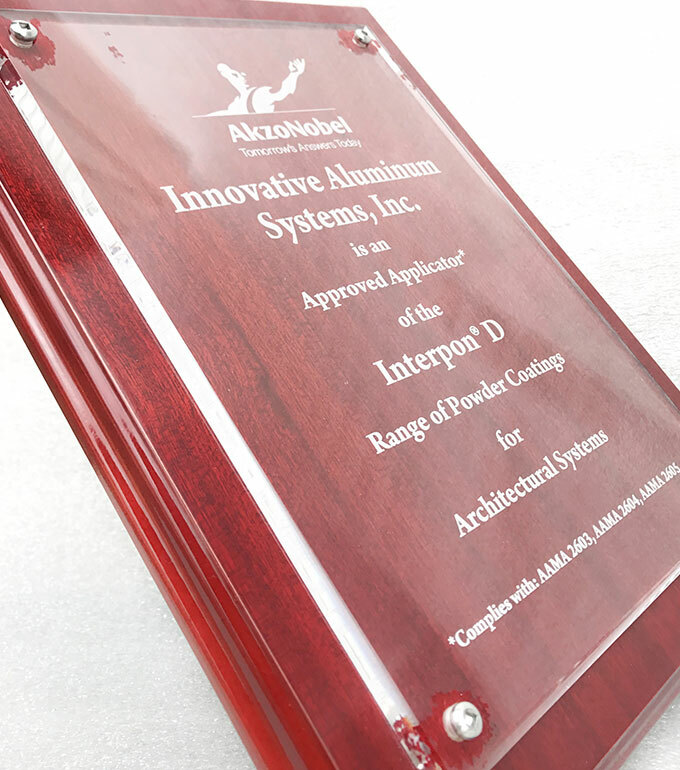 Innovative Aluminum Systems is certified to apply the next generation of superdurable AAMA (American Architectural Manufacturers Association) powders. AAMA 2604 and AAMA 2605 powders have been found to hold up longer than regular powders, and are associated with higher 5 and 10 year gloss retention ratings. Where many railing manufacturers settle for lesser AAMA 2603 powders associated with 1-year protection from chalking and fading, we at Innovative Aluminum Systems apply the more durable 5-year AAMA 2604 powders as standard, and are certified to apply the robust 10-year AAMA 2605 powders. Stage One consists of a heated alkaline based degreaser / cleaner to remove mixed metals, oils and contaminates prior to powder coating. Stage Two is an aerated R/O (Reverse Osmosis) cold water raise rinse to remove the degreaser / cleaner solution. Stage Three is an aerated acid based solution to etch and further clean the substrate of any contaminates and welding smoke. Stage Four is an aerated R/O (Reverse Osmosis) fresh water rinse to remove the degreaser and cleaning solution. Stage Five is an E-CLPS seal coat. E-CLPS is a chrome-free, non-phosphate liquid coating used to protect aluminum and zinc alloys with a clear, nearly colorless chemical Dried In Place (DIP) coating. When applied, the coating has excellent paint bonding properties and affords under-film protection. Note: R/O (Reverse Osmosis) is water that has been filtered to reduce TDS (Total Dissolved Solids) from the water, providing a cleaner substrate for improved powder adhesion. Innovative Aluminum railings are available in numerous durable, long-wearing finishes. A wide variety of custom colors are also available. Using superior powders in combination with our 5-stage, full submersion pre-treatment process, helps us attain top passing marks during the gruelling independent certification tests conducted annually by our quality powder manufacturers. Quality and consistency is important to us at Innovative Aluminum Systems. 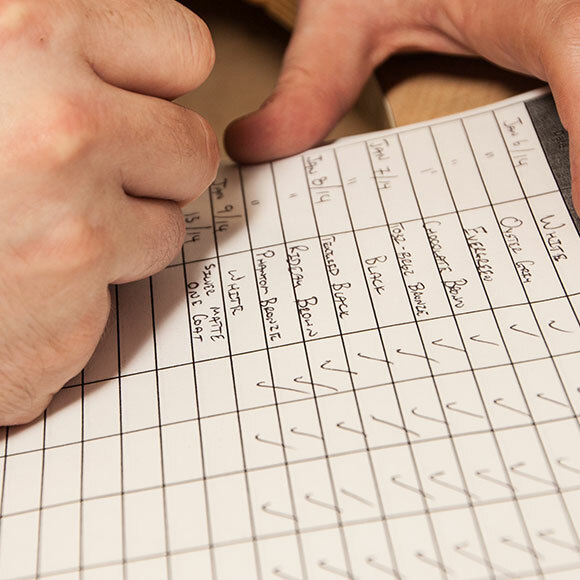 Daily testing, regular maintenance and a stringent adherence to procedures allow us to ensure that our powder coating is well within AAMA specifications.